Everyday, multiple people ask me what I’m doing in Spain. Why, of all the places in the world, am I here? Although my answers have varied slightly – to practice the language, to fill an empty gap on my travel map, because I love the laid back lifestyle – more often than not it boils down to one common answer: to eat. There’s nothing I love more in the world of food than tapas (well, other than cheese of course). Maybe it has something to do with the fact that I have an irrational fear of making decisions, or maybe I just prefer the social aspect of it all. But ultimately, I adore the idea of sharing many small dishes instead of eating one large one alone. When I arrived in Madrid I was ecstatic to start eating. 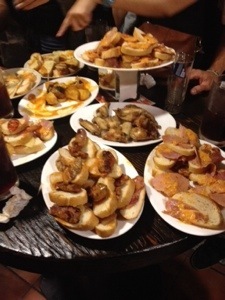 My first evening I ventured to a 10€ all-you-can-eat tapas at a restaurant called El Tigre. It was overwhelming. The restaurant managed to cram over 100 people inside it’s tiny walls. It was a standing only venue, with waiters carrying platters of tapas and trays full of 1/2 litre beers and sangria stacked three tiers high. I felt like a failure as a server after watching these men carry upwards of 24 beers at once through the crowded bar. The tapas, however, were great. So much bread and cheese and meat I thought I’d died and gone to heaven. But after 15 minutes of eating such a carb loaded feast, I found myself craving even the smallest of vegetables. But the platters kept coming, and every time I ordered another drink I was handed another platter of tapas: more than enough to fill a table of people. I was worried this was what all tapas were going to be like here in Spain. Although fairly decent food, I was sure to get scurvy within the week if I kept eating like that! Within hours, Granada became one of my favourite cities of all time. And tapas are its finest feature! I sat next to an Aussie guy named Luke on the bus down to Granada. It just so happened we were staying in the same hostel and the same room when we made it to the city: a sign of insta-friends. After a six hour journey down from Madrid, we were starving. We were recommended a nearby tapas bar to go for dinner and a drink. When we got there we noticed that the menu had no prices on it. In my experience, if you have to ask the price, it’s too expensive. In Madrid, 3.50€-5.00€ was a decent starting price for tapas. Then again, you could run across a place that was closer to 8€ and end up with a crazy bill after a few dishes each. We just about gave up on the restaurant when the waiter came out and I decided to ask what the cost was. Free. They were free? As long as you bought a drink (and that did not have to be an alcoholic drink) you got your tapas for free! Well in that case, we decided to sit down for a beer! With the price of beer being 2.50€ and the food for free, we were doing way better than any place I’d been in Madrid! Turns out, nearly every restaurant in Granada is like this. You can’t drink in the city without having some sort of food! And the food is outstanding. It puts every meal I had in Madrid to shame. 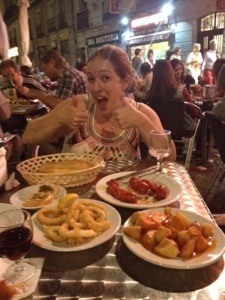 On my last evening in Granada, I went out on a tapas crawl with a crew from the hostel. We went to three restaurants, each more delicious than the last. We picked away at pineapple pork skewers and coconut chicken with polenta. We had falafels and mini Moroccan tagines full of delicious meat. We tried grilled cod and baby shwarmas. We spent 4 hours wandering from bar to bar, enjoying glasses of wine, catching up on all our travels, and talking about food. It was exactly how I want to eat every meal I ever have from now until forever! This is why I’m in Spain. If I am to be truly honest with myself, I’m here for no other reason than to eat! 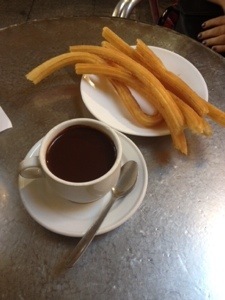 This entry was posted in Europe, Spain and tagged foodie, granada, spain, tapas, Travel by hilarylust. Bookmark the permalink. I share your love of tapas…I think it’s the best way to eat!